If you’ve been avoiding getting a new pair of glasses, or putting off scheduling a hearing test for the last few months, you may want to reconsider. Both poor vision and hearing loss have been linked to cognitive decline, and a new study shows that taking care of your hearing and vision slows cognitive decline by 50 – 75%! Cognitive decline can be difficult to notice at first. The reality is that cognitive decline is part of the natural aging process. As children and teens, our brains have a remarkable capacity to learn new skills, incorporate new information, grow new pathways, and develop in amazing ways. By the mid-twenties, this growth mostly stops, and while we continue to learn new skills, our brains aren’t as flexible as they once were, and we mainly use existing pathways in the brain to learn and develop, rather than building new connections. As we age, we stop using our brains as fully, and start to experience some cognitive decline as the cells in our brain aren’t as healthy as they once were. While it’s normal to forget where you put your keys, or struggle to remember a word sometimes, more rapid cognitive decline is a sign that something isn’t right. We’ll all experience some cognitive decline as we age, but there are ways to keep your brain active and healthy, and enjoy a full life, regardless of your age. A joint study between the University of Michigan and the University of Manchester in the U.K. looked at data from about 2,000 older adults in America. They accessed this data from the University of Michigan’s Health and Retirement Study, that measured hearing, cognition, and other health measures every two years for 18 years. The study found that hearing loss and vision impairment were closely linked to cognitive decline. 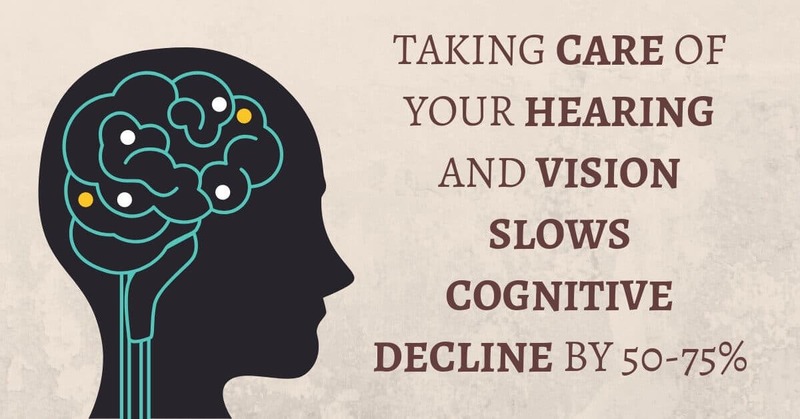 Hearing and vision loss cause cognitive decline because the brain is no longer receiving the same amount of input from the ears or the eyes. The nerves and cells in your brain need this stimulation to stay active and healthy, and when they don’t have a job to do, they start to degenerate or even die. This cell loss leads to more rapid cognitive decline, both in these parts of the brain, and in other areas, like the ones that control memory and concentration. For the adults in the study who wore hearing aids, their rates of cognitive decline were 75% slower than those with untreated hearing loss. Similarly, those who had cataract surgery to improve their eyesight had a 50% slower cognitive decline. As time went on, those who looked after their senses had similar levels of cognitive ability as those who didn’t have hearing or vision problems. Looking after your hearing health could be the key to keeping your mind sharp for years to come. Researchers have observed that when you wear hearing aids, the cells that aren’t receiving signals from the ear are activated again as more sounds are being processed in the ear. This means these cells won’t become unused, damaged or die, and you won’t face such rapid, permanent cognitive decline. Rapid cognitive decline has been linked to a much higher risk of dementia or Alzheimer’s disease, and treating hearing loss has been shown to lower the risk of dementia. This new study reinforces the research, and once again demonstrates that your hearing health is far more important than you might think. This research is promising in the fight against dementia, showing that treating hearing or vision loss can significantly slow cognitive decline, and reduce your chances of dealing with this degenerative brain disease as you age. If you’re ready to do the right thing for your brain and your ears, call us today at Roseville Diagnostic Hearing Center to schedule a hearing test. Our team of hearing specialists will help you discover your hearing range, and you’ll see on an audiogram just which sounds fall outside your range of hearing. To start to hear those sounds again, and keep your brain active and healthy, we’ll help you find the perfect hearing device that will have you hearing clearly.